It’s not Redbox Instant. It’s Redbox Instant by Verizon. I stress this because, well, apparently it’s a big deal to Verizon that they get referenced as much as Redbox (even if it makes for clunky headlines). 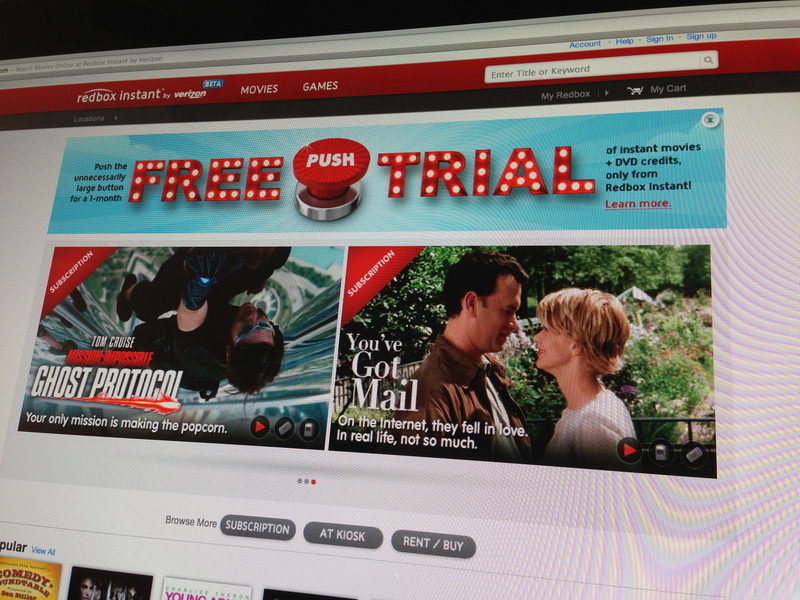 If you’ve never heard of Redbox Instant by Verizon, it’s basically a direct competitor to Netflix, offered by Redbox. And Verizon. Just like Netflix, you have the option to instantly stream content (of mostly older movies) right to your web browser or mobile device, and just like Netflix there’s also an option to get physical discs for newer releases. Unlike Netflix, those discs aren’t mailed to you. You pick them up from one of their many kiosks at grocery stores, 7-11s, and the like. The service is still in beta, and there’s a bit of a waiting period to sign up for it. The default plan costs $8/month. The default subscription comes with unlimited streaming of movies Netflix-style to your computer or mobile device AND up to four physical DVDs from their kiosks per month. 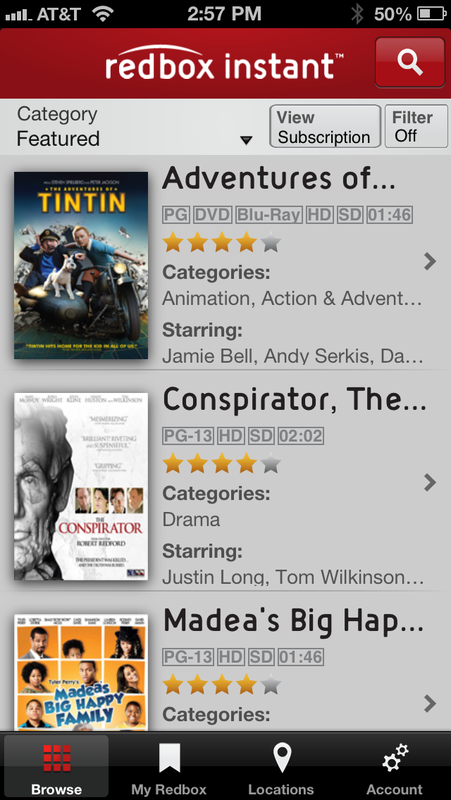 In addition to their subscription plan, they also offer iTunes-style digital downloads of movies for rent and/or purchase. Xbox users will have direct access to Redbox Instant LONG before Sony or Nintendo consoles (if they ever get support for it). The ability to stream content to your TV is currently very limited (see below). If you want your monthly subscription to cover Blu-Ray discs (in addition to standard DVDs) from their kiosks, it will cost $9/month. If you don’t care about physical DVDs or Blu-Rays at all, the subscription goes down to $6/month. Okay, now that that’s all out of the way, how’s the actual experience? First off, the sign-up process is very buggy. I got my authorization code to sign up for the free trial about a month ago, but it wouldn’t let me actually sign up. I tried again a few days ago and it was still very buggy — particularly text entry — but at least it worked. If you decide to sign up for it, be prepared to switch web browsers at least once and be very patient. 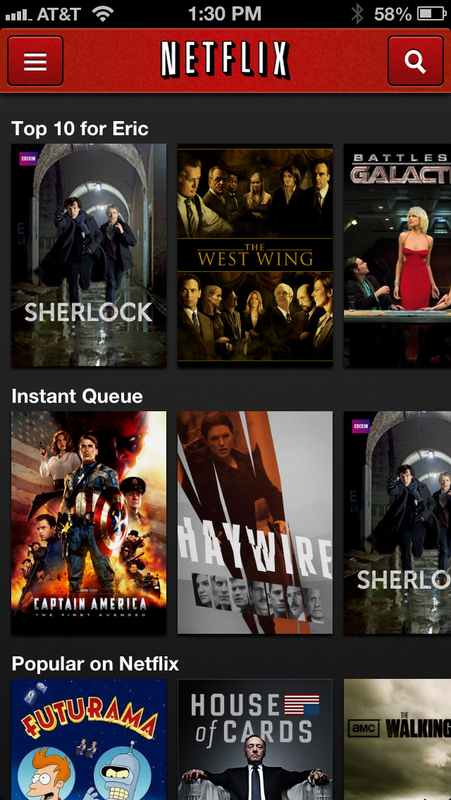 Netflix has the more robust library, but that’s no surprise at this point. I won’t even try to break down which movies could be found on which service because that’s constantly changing, though it should be noted that Redbox Instant isn’t even trying to compete with Netflix for TV shows. There isn’t a single episode of a single series to be found on Redbox Instant (or at their Kiosks, for that matter). So if you don’t care about TV shows, and you like a single subscription for both streaming and physical discs, Redbox Instant (by Verizon) may be right for you. Just one caveat; You’ll notice I used the qualifier “on the right device” up above. On the right device — like a newer iPhone or iPad (and I’m assuming Android devices, too) — the experience is on par with Netflix (save for the smaller library). But what’s it like on the wrong device? On the wrong device it’s practically unusable. And to make matters worse, that “wrong device” is your TV, which in my opinion is the most important device for movie watching. Netflix makes streaming to a TV super-easy. You can do it via any number of smart TVs or blu-ray players. You can do it from any game console. You can do it from this and this and this. And this. Oh, and this, too. Redbox Instant simply can’t compete in this area. They just signed an exclusive agreement with Xbox, so forget about using your PS3 or Wii for the time being. Only three Samsung Blu-Ray players are currently able to access Redbox Instant, and they’re all from 2011. (My top-of-the-line Samsung Blu-Ray player from 2012 isn’t compatible.) And the list of compatible TVs is pretty anemic (again, only certain Samsung models). I really wish they were more open about compatible devices BEFORE you sign up for the service. On their FAQ page they recommend hooking up your computer or mobile device to your TV using an HDMI cable. How quaint. Honestly, this isn’t a terrible suggestion, especially if you already have such a set-up (it’s a great way to get Hulu on your TV for free, by the way). But it’s far from ideal having to keep your computer running while you watch TV, not to mention the whole “now I have an extra cable to deal with” thing. And depending on your TV/computer/mobile device, the experience will greatly vary. A typical set-up will involve Company X’s hardware running Company Y’s software hooked up to Company Z’s television, which is not a formula for seamless connectivity. See how much black there is around the image from the movie? This isn’t an aspect ratio thing. 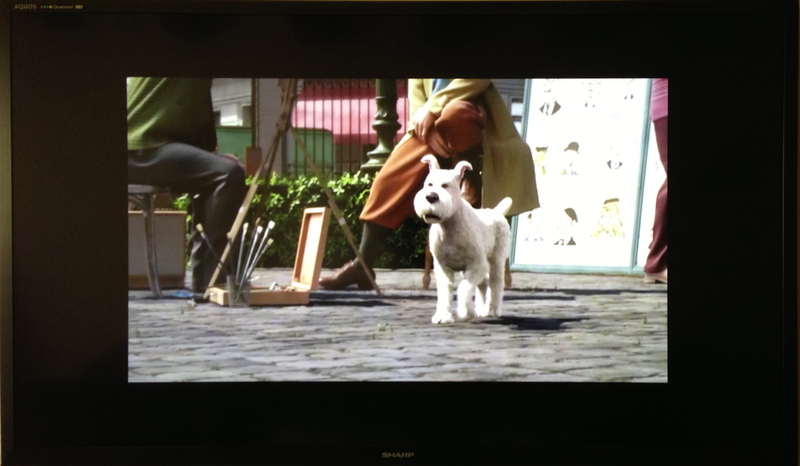 The letterboxed image is the same aspect ratio as the TV. It just doesn’t fill it. To make the image fit I have to use the TV’s “zoom” function. The end result is a movie resolution that’s only a fraction of what it should be. Most movie apps for the iPad know how to properly send content over HDMI. Redbox Instant isn’t one of them. Redbox Instant’s FAQ also recommends that owners of Apple TVs use Airplay mirroring (if they also have a iPhone, iPad, or newer Mac laptop) to push content to your TV. Airplay mirroring, in general, is great. If you own an Apple TV and you aren’t using Airplay mirroring to connect your iOS device to your TV, you’re missing out on one of Apple’s coolest features. But Redbox Instant somehow manages to even mess Airplay up. When mirroring via Airplay, the image still doesn’t fill the screen. An iPhone 5 works better than the iPad because the screen has a more cinematic native resolution, but it still has a thick border around all sides. Netflix, it should be noted, has no such issues with Airplay. The image fits the screen beautifully. But, then again, you don’t need Airplay to push Netflix content to your television because Netflix is already baked into Apple TVs. This is where I should remind you that the service is still in beta and that the number of compatible devices will surely grow, but since it’s a PAID beta (after the first month), a certain amount of usability should be expected. And until I can watch high quality content directly on my TV, it’s not worth my 8 bucks. a) You live near a Redbox kiosk and really like the idea of a combo disc/streaming service. b) You have a 2011 Samsung Blu-Ray player or TV, an Xbox 360 (with its own Xbox live subscription) or a computer already hooked up to your HDTV. Or you don’t care about any of that and you just want to watch movies on your tablet/laptop. If you’re not both A and B, then this isn’t the service for you right now. Wait a few months — if not longer — before trying it. No point in wasting the 1 month free trial only to discover on day 1 it’s not practical for you. I’m in group A, but not in group B. So I’ll be canceling my subscription when the trial ends. I haven’t written off the service, though. I’d totally consider signing up again, I just hope they’re working as hard on getting it on more devices as they are on getting it more content. Content, oddly enough, is pretty decent considering how young the service is. I still have three weeks left on my free trial, though. So if anything changes in that time, I’ll update this review. Note: If you decide to give it a try, hang onto the authorization code they email you. You need it for every device you want to activate. My free trial is up and I cancelled the subscription. Nothing I’ve mentioned above has been addressed, and I have no interest in paying full price for a very, very beta product.